Don’t you wish sometimes that life could be really dull, drab and boring? It can get a little too exciting for much of the time, leaving you breathless and with no time to sit back and recall all the fun you’ve had. Being out on the hills tends to energise me and is far more pleasant than sitting in the studio, especially when you have to listen to the racket of builders across the road with their loud radios and screaming stone-cutters. And I usually take a cappuccino and Danish pastry out with me anyway – it’s amazing how it helps the washes flow across the paper! 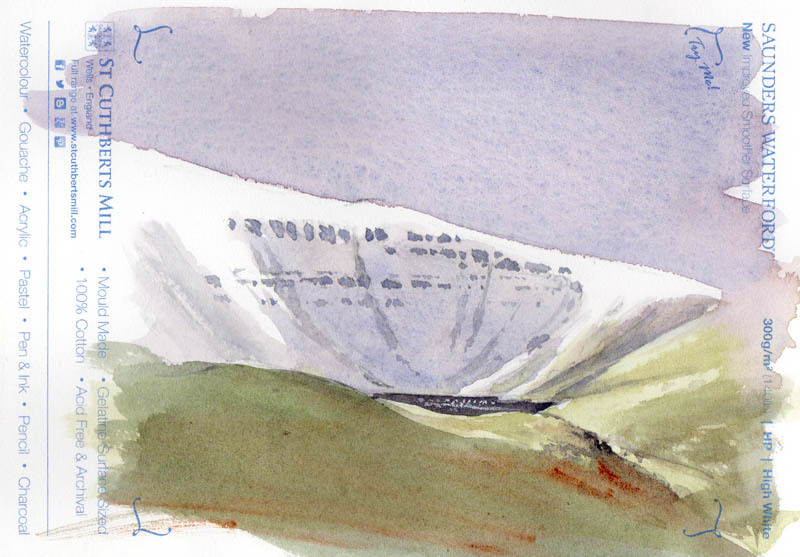 When I went out recently on the Brecon Beacons, I took with me some small sample sheets of the new Saunders Waterford High-White hot-pressed paper from St Cuthberts Mill. It really is delightfully smooth and as one would expect with St Cuthberts, it takes the washes well. As you can see in the rough sketch, the snow really does stand out on this paper. Note how the terracing of the rock outcrops appears in broken horizontal lines, with a few gullies sweeping down here and there. It’s important to spend a few moments observing these aspects as they give a marvellous sense of place in your work. This paper also works well for wash and line work, and should be in the art shops fairly soon. I can’t wait to work on some big sheets. I shall be demonstrating at Patchings Art Festival next month in the St Cuthberts Mill marquee, on the 9th, 10th and 11th June, so I hope you can come along and enjoy the event. It’s always a great pleasure to be there, with so many artists and crafts-people, and of course, all the materials to check out. 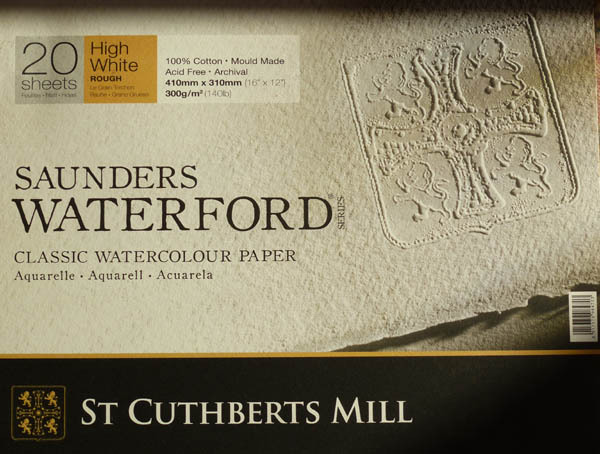 And make sure you try out some of the Waterford HP paper! 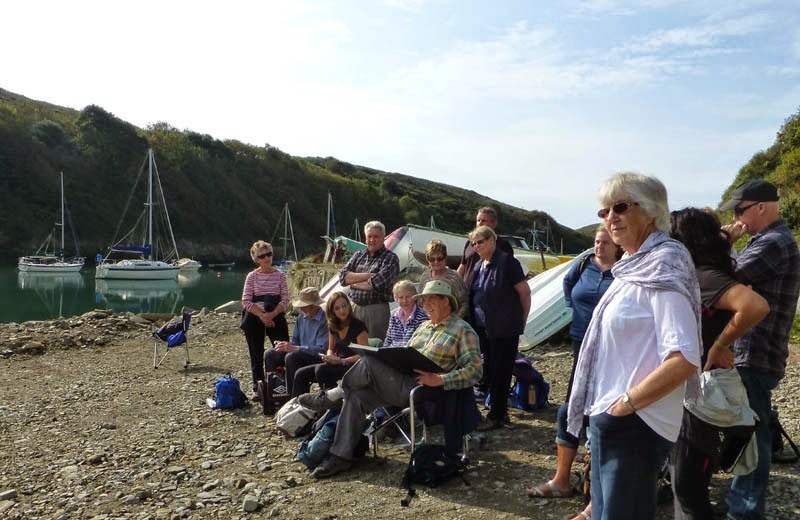 Jenny and I have just returned from running a painting course in St Davids in Pembrokeshire, where we were blessed with some wonderful autumn sunshine for most of the week. Solva looked especially appealing in the clear light. The picture at the bottom shows me demonstrating with a ‘lay-flat sketchbook’. Writing blogs on a steam-driven laptop is an extremely slow process, and with extremely poor internet connections it can take me hours, which is the reason I’ve slowed down the number of blogs I do. Technology in Wales seems to be in some sort of reverse decline, and once the black-outs start hitting us it will be even worse. Progress is a funny thing! Jenny and I enjoyed Patchings Art Festival, where I did two demonstrations in the St Cuthberts marquee to large, enthusiastic audiences. It’s always a joy to work with St Cuthberts Mill, and the Saunders Waterford High-White paper is superb for getting the best out of your watercolours. I’ve just taken some new watercolours to Art Matters in White Lion Street in Tenby (Tel. 01834 843375) and this is one, showing a quiet corner of Tenby harbour. 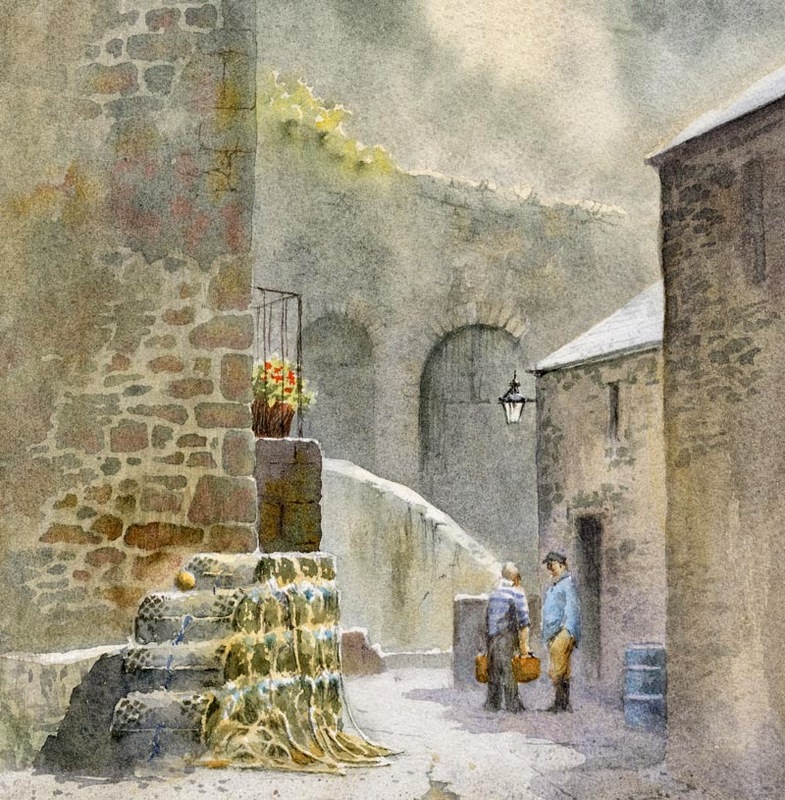 The lovely old stone walls provide an interesting backdrop, and these were done by laying an initial wash of Naples yellow over the entire area, and once this was dry painting in the stonework with cobalt blue plus cadmium red, to which I added a few drops of yellow ochre while the stones were still wet. I left some of the Naples yellow showing as light-coloured mortar between the stones. Once again I waited until the whole area had dried and then glazed it all with a weaker wash of cobalt blue and cadmium red. This both imparted a greater sense of unity and slightly softened off the edges of the stonework. The background has been considerably simplified so that the emphasis is thrown onto the figures in conversation, and the surface was Waterford 140lb NOT, which is excellent for taking repeated washes if necessary. 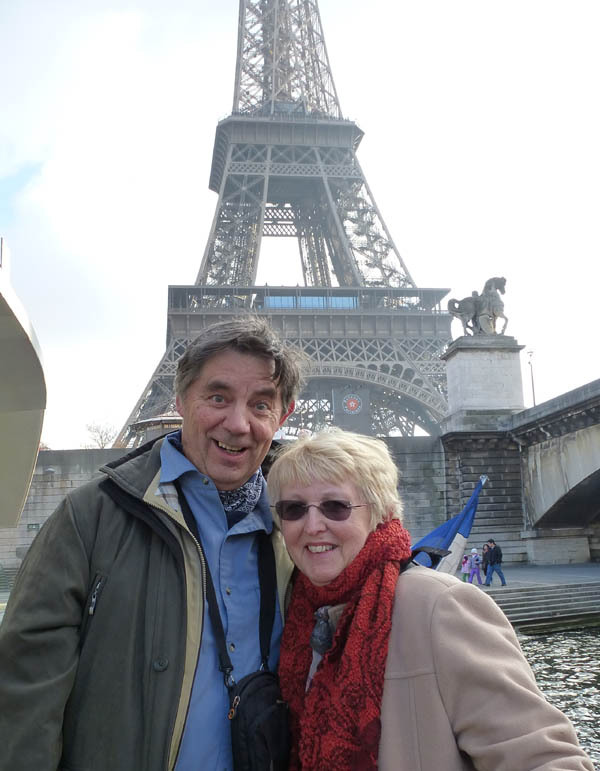 Jenny and I have been in Paris on a short break to see my daughter, and we were blessed with glorious sunny weather. This enabled us not only to have a very enjoyable time, but for me to do the occasional sketch during our pauses. There’s usually some time during the day, even in a place as busy as Paris, to spend a few moments recording a scene, and it makes a lovely souvenir of the trip. 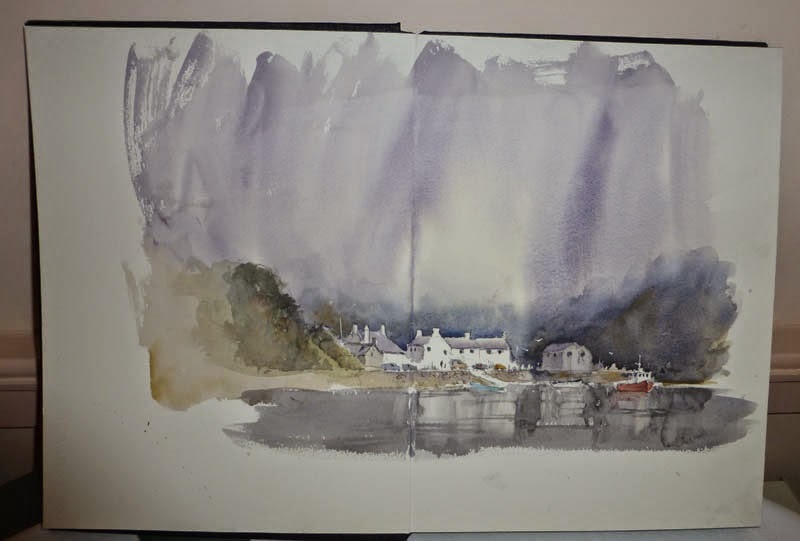 As I’ve mentioned before, we often produce an illustrated journal from our travels, but sometimes it’s nice to carry out a watercolour on proper watercolour paper, even if it is more in sketch form than a completed painting. I nearly always take a folder with a variety of watercolour papers, NOT, rough, hot pressed, tinted, and so on, on my serious trips, but often it’s great to keep things simple and just take along your favourite watercolour paper. We should all have favourites, so if you haven’t you really should try to find out which papers suit you best. For me the real star is Saunders Waterford, as it has an interesting surface texture combined with a truly robust nature, because it has been internally and externally sized. This can be an absolutely vital attribute if like me you make mistakes and need to sponge or scratch the paper to remove mistakes, or indeed, as a technique for creating certain effects.